Deutsche-Telekom owned T-Mobile on Thursday announced another Un-Carrier move in the form of a brand new service, called ‘Mobile Without Borders’ and available starting July 15 in select Canadian and Mexican markets. 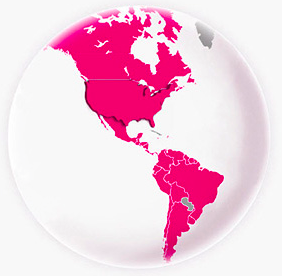 T-Mobile’s U.S. business and individual customers with Simple Choice postpaid and prepaid plans will be able send and receive unlimited phone calls, text messages and use 4G LTE data, to and from Mexico and Canada, at no additional cost. Because T-Mobile had to partner with local carriers in Canada and Mexico to implement 4G LTE roaming, the service is currently available in select cities listed on T-Mobile’s website, with more possibly added in the coming weeks and months. ‘Mobile Without Borbers’ effectively lets T-Mobile users use 4G LTE data straight from their Simple Choice 4G LTE data plan, without incurring roaming charges for phone calls, texts and data. “Introducing Mobile Without Borders – your Simple Choice plan is expanding to cover texting, calling and data in Canada and Mexico at no extra charge. Enjoy, continent!,” reads the blurb. As if that weren’t enough, Music Freedom is included in ‘Mobile Without Borbers’ while roaming in Canada or Mexico. Here’s T-Mobile CEO Jonh Legere introducing ‘Mobile without Borders’. There’s just one caveat: ‘Mobile Without Borbers’ does not use 4G LTE data stored in your Data Stash. Also, Canadian and Mexican residents cannot use ‘Mobile Without Borbers’ as it’s only for T-Mobile’s Simple Choice customers who reside in the U.S. and are on T-Mobile’s network. Beginning July 15, T-Mobile will automatically enroll new Simple Choice postpaid and prepaid customers in the new program. Existing Simple Choice customers can manually opt-in on T-Mobile’s website, by phone or at one of carrier-owned retail stores for free. “After spending billions buying up Mexican telecoms, AT&T’s CEO is promising ‘the first seamless network covering Mexico and the U.S.,’ something ‘unique’ that ‘nobody else will be able to do for the consumer.’ So much for that. They won’t be the first. And they won’t offer Canada for free,” said John Legere, president and CEO of T-Mobile. Existing customers on legacy plans must pay $10 per month for ‘Mobile Without Borbers’. Details are available at t-mobile.com/3countries. For information about Mobile without Borders for business, check out t-mobile.com/3countries1price4biz. In other T-Mobile news, the company reported its preliminary financial results for the second quarter earlier this morning. According to a media release, the carrier has added 2.1 million customers during the second quarter of this year and now counts a cool 59 million customers.